I honestly don’t remember how long I saw Kathy Hoppe. It didn’t take me long to figure out how to play her. She seemed able to read my mind, sometimes to even know how I felt before I could identify my emotion. Kathy knew why I wouldn’t eat, she said. I was trying to control things in the family. I felt overlooked and less important, talented, special or desirable than my sisters. There was too much pressure to perform as the “mature oldest daughter” that everyone thought I was. I was lonely, living in a small town having been homeschooled for so long. I simply had to be smarter to beat her at her own game. Controlling Kathy’s opinion of my recovery became a new challenge, a new high. I snuck jumping jacks in after bedtime, in the dark, in the bathroom. I walked the long way around things, always stood and bounced my knee with purpose and passion. “I really think we’re making progress,” She would say one week, while perusing my list of 2000 calorie days, only about half of which was true. But my body betrayed me. My weight continued to decline, albeit slowly. I had taken up jazz dance because it put a time limit on my official workouts, which placated my parents and therapist. I had to get knee pads for some of the moves because my bones dug into the hardwood floor. We had one dance that finished with us laying on our backs. I got bruises on my spine. Pretty soon Kathy started making threats too. October. A month before my most dreaded holiday of the year. Our family of six left the house under a steel colored sky and drove mostly in silence toward Laurette. Laurette is the only inpatient treatment facility in Oklahoma for eating disorders. Generally, it was a psychiatric hospital; their program targeted at anorexics and bulimics was brand new. I was numb walking through the heavy sliding glass doors behind my parents. Dad drug my small suitcase. There must have been tons of admission paperwork, but I don’t remember anything until the supervising nurse led us to my room. All the walls in the facility were light yellow, a dull lifeless color. Fortunately, one wall was replaced by windows looking out into well cultivated gardens, with a goldfish pond. It felt like a surreal tour of a haunted house, as the nurse led my family, her clueless captives, toward the room that was to be my whole home for the next 30 days. Doors lined the way on every side. They locked from the outside with a reverse peephole. A three digit number marked each room’s address. “I need to go through your suitcase,” she said. “Why? We packed according to the directions in your literature. She only has one soft-sided bag,” my dad informed her. Apparently, there are numerous life threatening items that we use everyday. I watched helplessly as the nurse broke the glass out of my cosmetic compacts. I felt my dignity crack and crumble as well. She confiscated my shoe laces. Finally, she stood. My eyes blurred and my hands shook as Mom and my sister, Jennifer moved all my t-shirts and jeans to the dresser. Rachelle held my hand and watched with me in silence. Daddy drew our family into a group hug and prayed. Laurette was not for me. 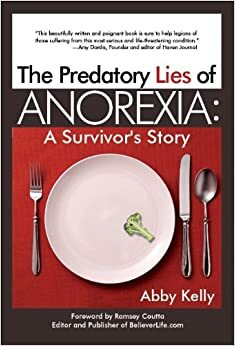 The eating disorders program was underdeveloped so they lumped all seven of us eating disordered patients into the group therapy sessions with schizophrenics, suicide watch patients and drug addicts. I recall one high school age boy telling about a wacky drug trip he’d taken before being admitted. Another man threatened to beat the counselor with a chair. For 72 hours I was on phone restriction. But the moment I was released for my first phone call, I held the receiver with a death grip. They must have still loved me. They came to rescue me.